I really love the look of topiaries and decided a Christmas-y one would be a fun decoration! I decided why not just make one! Want to make one too? Here's how! 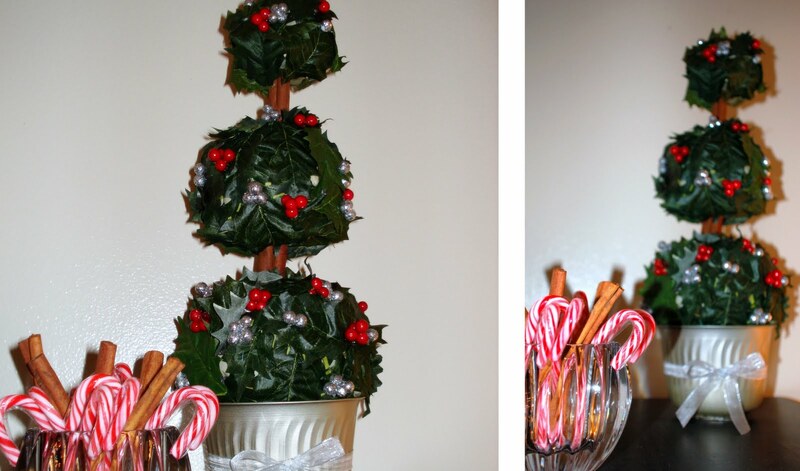 You'll need a hot glue gun, cinnamon sticks, a small pot or bowl for your topiary base, winter foliage (mine was the inexpensive faux stuff from Wal-Mart, foam balls to glue your foliage onto--or make your own balls like I did with bubble wrap and masking tape I already had around the house! Buying three foam balls was a little too pricy for me, and they weren't available in the three different sizes that I was wanting...so my answer was diy! I found my little pot at a thrift store to use for the base of my topiary. The little pot wasn't my favorite color so I spray painted it with Krylon brand paint in 'champagne nouveau'. Form the balls for your topiary to the size you want (or use foam balls). Poke holes in the ends for the cinnamon sticks and assemble. I put some hot glue in each socket before I stuck my cinnamon stick inside to hold it better.